then we’re going to be discussing overall integration, which talks about how your teams can can work together. So we’re going to start out by talking about increasing SERP visibility, which means Search Engine Results Pages. And as you know, that’s really the bread and butter of paid search and SEO. But by working together, you can actually increase your visibility and not only increase your visibility, but your clicks and revenue. We’re going to start off by talking about how to make sure that you’re leveraging paid search above the fold. As you know, AdWords has really changed their format over the past couple of years, and are constantly testing new formats. 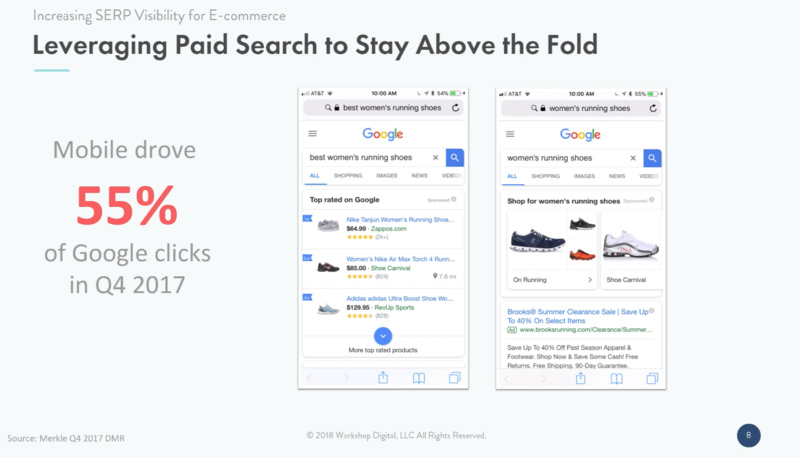 The most recent change was removing the right hand rail ads, and now particularly in ecommerce and retail, you’re seeing PLAs above the fold even pushing down paid search ads. This is further pushing organic down the page. So making sure you’re having paid visibility on top of strong organic rankings is really important. This is especially important in terms of mobile and Q4 2017, Google saw 55% of clicks on mobile. And with this, in this screenshot you can see that sometimes PLAs take up the whole top of the fold – other times, you’ll see one or two text ads, or PLAs and text ads – so really, you’re minimizing your organic visibility off the bat. In the SEO world, this is one of our least favorite things to talk about, because you have your SEO, your organic rankings are doing so well…and what Google is doing is they’re allowing for more paid ads up there, which is great, if you utilize your paid ads, but bad for the SEO as it’s being pushed down. One of the other aspects that you can do in leveraging your two teams together is around your keyword rankings. Now, I think we all know that when you’re working with SEO, that’s going to take a little bit of time. And as the time passes, and as it takes time, I guess, for your SEO [analyst] to develop your SEO strategies, you may be able to leverage your paid campaigns or PPC to help in some of these scenarios. So here, this slide we talked about that that blue line, there’s is one of our clients and those other lines are their competitors, right. So this is their search placement on Google for different keywords. 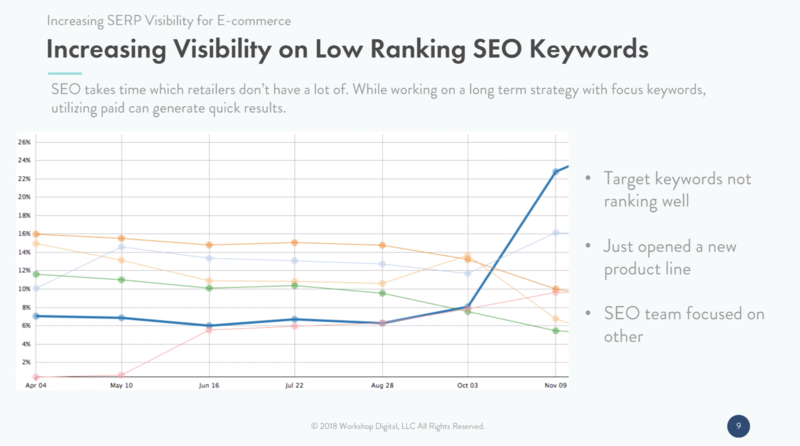 And for around six months while we were working on strategies, and because it took so long to implement, we were not really able to see the results on the SEO side. So this is a great example where the SEO team could provide those keyword – that keyword data – to the PPC team to be able to leverage those keywords and get placement where it may take us a little bit of time. And even after we made that placement, so after we finally had that success and are able to seen, we still want – and we’ll talk about this a little bit later – but we still want that placement on the paid side as well. One of the other aspects that we can use when implementing and and combining these strategies together, is if you have a great SEO piece of content that’s out there, and then all of a sudden does incredibly well, it goes viral, or there might be a reason it’s gone really well. As an example, a great piece of content that on the SEO side has done well, here in Virginia, we wrote a piece of content about the history of hurricanes that hit Virginia. And while Hurricane Harvey was was impacting Texas, we saw a lot of volume for Virginia based terms for people researching. So all of a sudden this piece of content that we wrote months and months back is finally getting some placement, a lot of viewers. So we can share that data by utilizing keywords that we find in Google Search Console, we can utilize that data, provide that to the PPC team, in order for them to start utilizing some paid traffic as well. So we talked about having the visibility, but what does this really mean in terms of traffic and revenue? 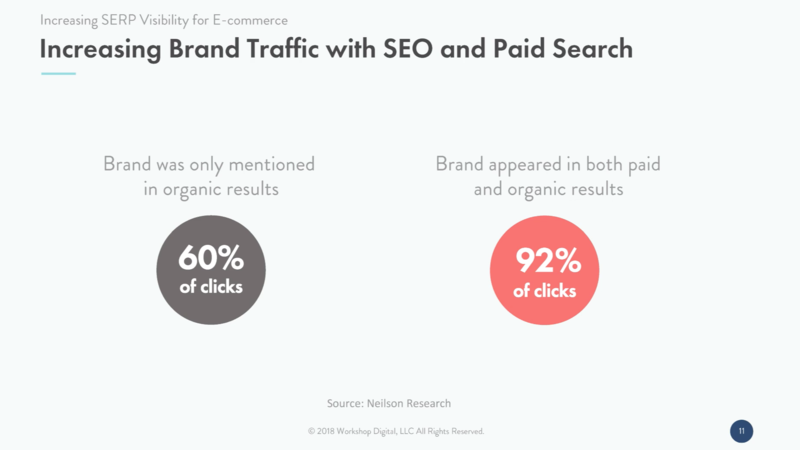 Nielson shared a study recently, that when your brand was only mentioned in organic results, you saw about 60% of the clicks. But when you paired that with a paid search ad, you actually saw 92% of the clicks. It’s also important to think about revenue, and how this is affecting revenue working together, and having that dual visibility. 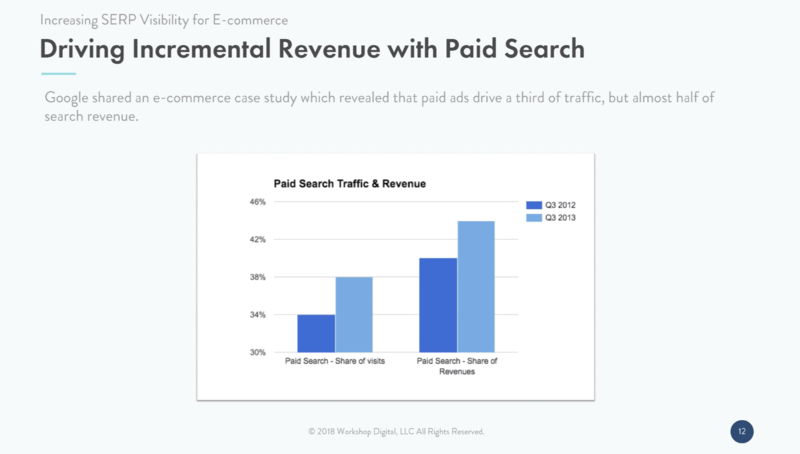 Google shared an ecommerce case with us that revealed that paid ads drove about a third of the traffic, but then almost half of the revenue. So this is really indicating that people who are more likely to click on the paid ads have more of an intent to purchase. So having that dual visibility is super important for your traffic and your revenue. So we talked about having that visibility on the SERP, but what are you actually going to show your audience? What kind of creative is going to resonate with your audience? 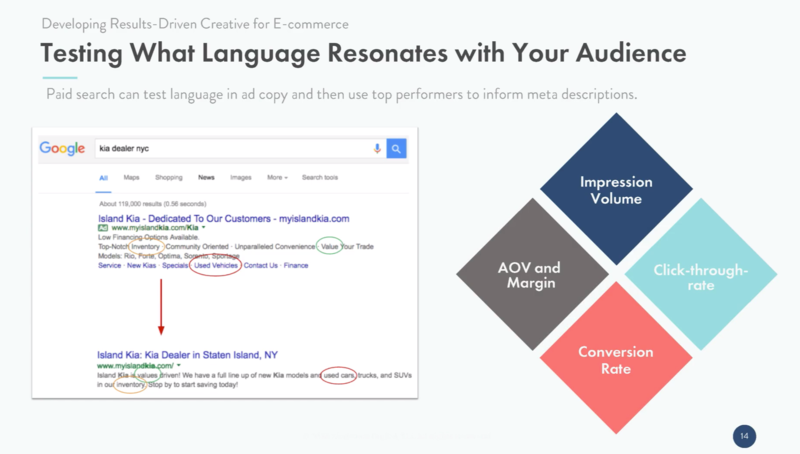 So it’s really important to develop results-driven creative and with paid search is really nice, because we can do some really good testing in terms of what language is resonating with your audience. So we can do that through ad copy testing, or looking at top keywords. And in this example, you can see that there are certain keywords that customers really are attached to, really respond to, such as “value” or “used vehicles.” And we can then after testing that on our side, share that with the SEO team, so they can incorporate that language into their meta descriptions and title tags. And on the keyword side, we also want to look at in terms of what keywords are performing, what’s their impression volume, what’s their click-thru rate, their conversion rate, and their AOV and margin they’re driving in terms of return. One thing to note on this as well, from the SEO side, there may be some concern that by incorporating some of these converting keywords that you might lose some of your SEO ability if you replace those keywords out. And when you do this within the meta description, there’s no risk of that. So utilizing those keyword phrases into your meta description will really help increase the conversion rate as discussed here, and not impact your SEO. 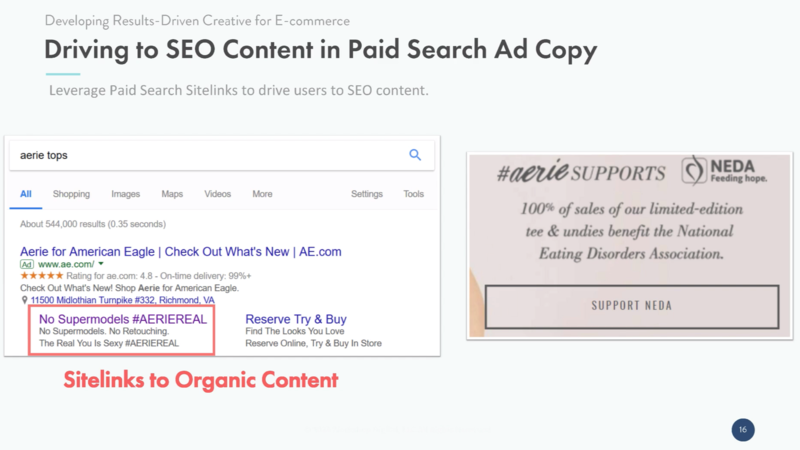 Paid search is also able to support SEO because we can drive towards SEO content in our creative and our ad copy. And one way we’re able to do this is through site links. So in this example, Land O Lakes butter, you see a more product-driven main body of the copy and also the site link that talks about where to buy. But look at the bottom two site links. They’re really driving to organic content, recipes, cooking and baking tips. So having this content is valuable to users, and supporting the SEO team in continuing to build awareness of this content is super important in a way that we can support the SEO initiatives. And the second example, you can see the search query “aerie tops” is very purchase-intent. And this is looking for a woman’s clothing tops. What this brand does is they have the main creative driving towards a tops page, but they’re also supporting one of their main brand initiatives, “No Supermodels #AERIEREAL.” And this is then driving to a page that talks about how they’re actually supporting the National Eating Disorders Association and developing that brand content and that brand awareness. So, less purchase intent, and more supporting pieces that are being developed, and content being developed promoted to organic. On the SEO side, this is a very important factor in something that the PPC side can really help out [with]. From the SEO perspective, in almost all scenarios will only have one website or one page of your website to rank for any given term. And so utilizing some of the efforts of the PPC team, you can start showing additional content such as brand content or some additional SEO-supported content to help your viewers and users. Whereas on the SEO side, you’re really limited to just that one page for each term. So this is a great avenue for PPC to help out. We were actually talking about as these content pieces gain visibility, it’s more likely that an influencer or news site could pick it up and actually backlink to this content. 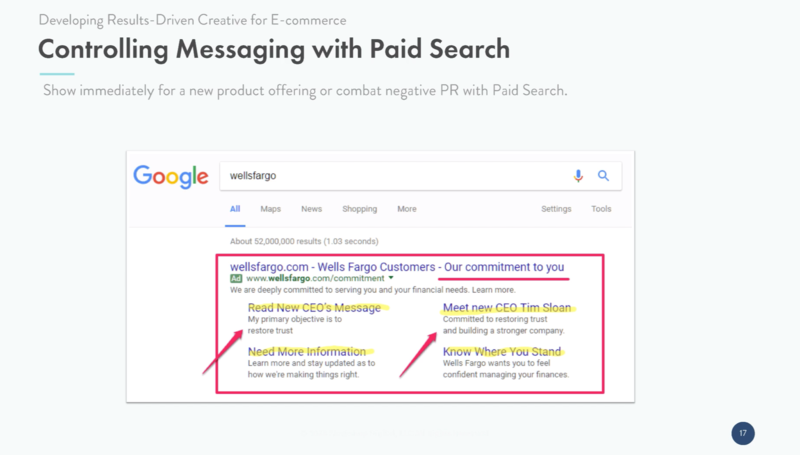 And finally, paid search gives you immediate control of the messaging that you’re sending to your audience. An example of this is Wells Fargo. Unfortunately, they’ve had some poor press over the past couple years, but they actually did a great job of sending out a paid search ad that really focused on recommitting to their customers and the site links in particular, “Read New CEO’s Message,” and how their primary objective was to “restore trust, need more information, stay up-to-date on what we’re doing to make things right.” So these are really positive messages and wanted to make sure that people searching for Wells Fargo saw this front-and-center versus other things that could be cropping up such as news articles, or poor press. So this immediate control was really impactful for them. On that note, too, so Wells Fargo I’m sure had a great organic placement for the words with Wells Fargo. But given the news and the social aspects, those will show above the organic in most cases. So that’s going to push your regular organic page down. So being able to use these these site links to help push a message that is being naturally pushed down by bad press is a great way to get ahead of the issue. 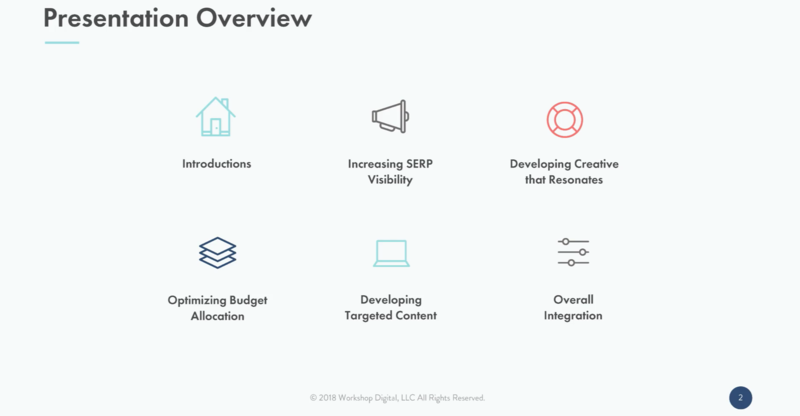 When we’re talking about paid and SEO, a lot of times, we say “let’s not talk about budget,” but that’s really important for the paid side, and we can work together to actually optimize in that area. We’re able to do that because as you know, we can look at what’s happening in terms of SEO. And there’s usually two scenarios: you’re either limited by budget, or you have extra budget. And so when you’re limited by budget, you’re actually able to work with SEO to potentially ask, are there strong organic keywords that are ranking where there’s limited paid competition where you could potentially pause keywords and allocate those funds to other areas, if you’re limited on budget. The other side of it is having extra budget. And when the paid team has extra budget, we can work with the SEO team to understand what’s going on in terms of their space: are there keywords like you’re discussing earlier, Andrew, that are lower down the page than optimal? So we can make sure we have a paid ad present to maintain that visibility – making sure that we’re aligning with their goals as well, and supporting them. And if there’s a strong keyword for you all that’s converting, we have the opportunity to make sure we have that dual visibility in that space. That’s one of the key points or key areas that the SEO team can manage and have insight into to be able to make this work – a keyword tracking tool. So we utilize STAT as a keyword tracking tool, there are plenty others out there, SEMrush is another one that some may use, but being able to track those keywords will easily allow you to provide that data to the PPC team. Without it, you’re not able to find any of that extra insight of keywords that are either ranking well or not ranking well. So finding something that you can track your keywords in is really gonna make a difference there. Thinking about your budget space, something that’s happening in industries is that CPCs have continued to rise over the past five or six quarters. And actually in Q4 2017 CPCs rose an average of 14% year over year. Seeing this continuing increase in CPCs is really important to consider as you’re allocating your budget. And so what impact do we have on that area? Well, we can impact to an extent one of the factors of quality score, working with SEO, and the landing page experience. And in this example, you can see this keyword, it has a very low quality score. And one of the factors that’s contributing to that is a below average landing page experience. And so Google tells us that to have a good landing page experience, it’s really about matching your content to a person’s search term and having a good user experience that’s relevant. So if we have keywords that have less than optimal quality score, we can work with our SEO team to provide some optimizations there. The SEO team has a ton of experience with those optimizations, too, because those same rules have applied to every organic page that we work on. So we know how to work with these types of scenarios. And there are four main areas that we work with in order to provide that relevance and increase that quality score. That’s keyword optimization, semantic search, image optimization, and page speed. With keyword optimization, some of the key areas that you’re going to want to have that keyword placement is in your title tag, or anywhere in the copy of your website. 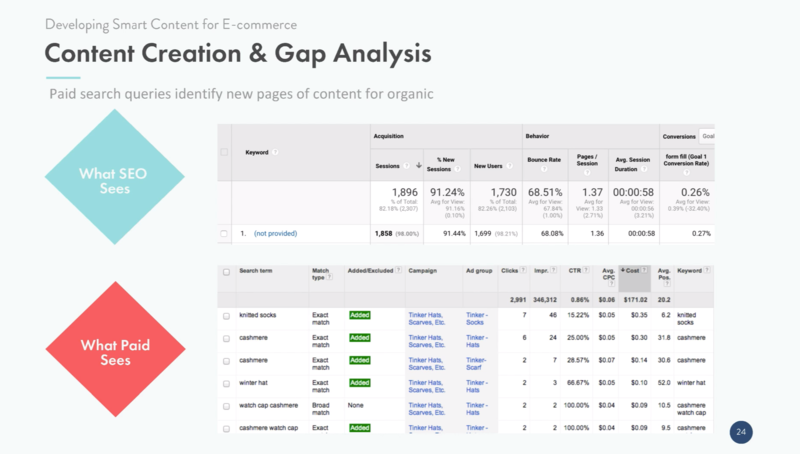 With semantic search, you’re going to be able to see different aspects of the same keywords, mentioned different ways, and being able to provide those. So related keyword terms of being able to provide those in the content as well. Image optimization, there are two main aspects, one is the alt text, and that is the text that describes the image. This is allows Google to not only see what the image is, but to provide a description by you for that image. Now, you don’t want to be spammy here, that’s where you need to be a little bit careful. But be able to describe the image but also mention the keyword in there if possible. The other item with image optimization is the file size of that image. So, not the actual size, not what seen on the website, but the file size, you’re going to want something smaller, which will really help with page speed. And page speed in and of itself is an important aspect with any SEO or PPC campaign. Users care a lot about how quickly a page will be able to load. So being able to have a page that loads fast will help with that quality score, and overall SEO and PPC efforts. Now let’s talk about developing what we what we call smart content. So this isn’t just normal content, we’re not going to come out here and tell you just to keep on writing more and more content. Smart content, the way that we use it, is utilizing data from from both sides to be able to create that content. Now, in order to drive or create great content, you’re going to have to have keywords, and a lot of what we use are keyword based content ideas. Now, what SEO sees is very limited, we have very limited insight into keywords, specifically, what keywords are being searched when they land when users land on your website. Although we have some tools, they’re fairly inaccurate and we are unable to apply that knowledge. PPC, on the other hand, has tons of data around the actual search queries used, the interaction on your website, and the conversion levels and impressions of those as well. So utilizing the PPC data can really help help drive your content. So I want to go back and look at what kind of metrics we’re looking at on the paid search side to then supply that information to SEO for content development. We’re looking at new search query trends. So what’s coming up that’s new and different in our search terms report that we can share? Maybe it’s a new product, maybe it’s a new color of something that’s becoming popular, a new style. For example, I’ve got to work with a woman’s retailer previously. And when high waisted jeans came back in a few years ago, we immediately saw those coming up in our search terms report. You also want to identify higher volume keywords, you want to have enough volume, enough search intent, enough searchers to warrant actually developing and taking the time to develop content for that. Then you want to think about your top converting keywords, you want keywords that resonate with your audience, but also are driving conversions. And then on the flip side, you have the opportunity to also share performing keywords and user keywords or topics that we don’t necessarily want to call rich content for. And finally, keywords that drive high average order value or margin for your business is important, so making sure that you maintain that visibility and then further develop out content there to gain some user interaction. I wanted to walk you through an example. This is showing conversion rate by keyword, we’re going to call “ZZ Dog Toys” brand and that has a conversion rate of 8.2%, so that’s a nice brand conversion rate; “Durable Dog Toys” has a conversion rate of 0.3% and “Toys for Puppies” has a conversion rate of 6.1% and when looking at this, what we want to develop content for is “Toys for Puppies.” So we work with our SEO team to maybe develop a blog post about the best toys for puppies, or getting a puppy, or maybe an infographic on how to train your puppy – provide that content around puppies and toys for them for the users. Another great opportunity in terms of looking at new search terms is what’s a new trend? And if you’re familiar with Game of Thrones, you remember a couple seasons ago that House Mormont became really big and really popular. So if you’re not familiar, think Harry Potter, the different houses…but really, a new character popped up. And so this website was actually able to recognize that and their search terms reports and build out navigation that highlighted this and built out a product page page and content to support this. You know, this is really important too, because from an SEO perspective, that insight of being able to find that searchers was searching for that new house would not have come to the SEO team for months potentially, as they’re not in that day-to-day. And plus the data that we do receive wouldn’t be this insightful. So this is a great insight where almost immediately you’re able to see those trends, those queries around this. And we’re able to do some quick actions and be able to provide that content. Because if it’s important on the paid side, it’s also important on the SEO side. So being able to put it in the navigation and create the content would turn out great. So paid search is also able to run landing page tests. 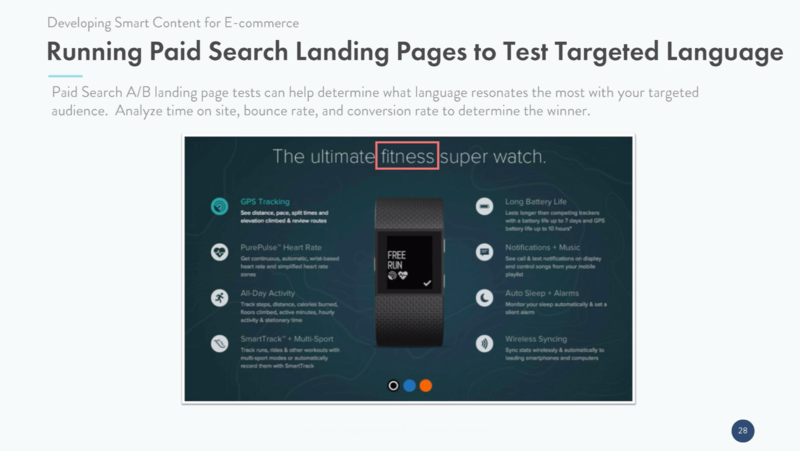 In ecommerce, there’s a couple things you can test. You can test category pages versus a best selling product page. For instance, someone’s searching for jeans, are you landing them on the women’s category page or the men’s category page? So lots of good A/B testing can be done and we can develop some quick results, how we can do this to help SEO is we can look at on the different landing pages, what language is resonating? What themes are resonating to develop for the rich content? In this example, with Fitbit and their ultimate fitness super watch, they’re really harping on the word “fitness”. But maybe it would resonate more with the audience if it’s calling out “runner.” Focusing on if we were to see that play out in terms of testing, maybe that’s an indication that we should develop some runner content. 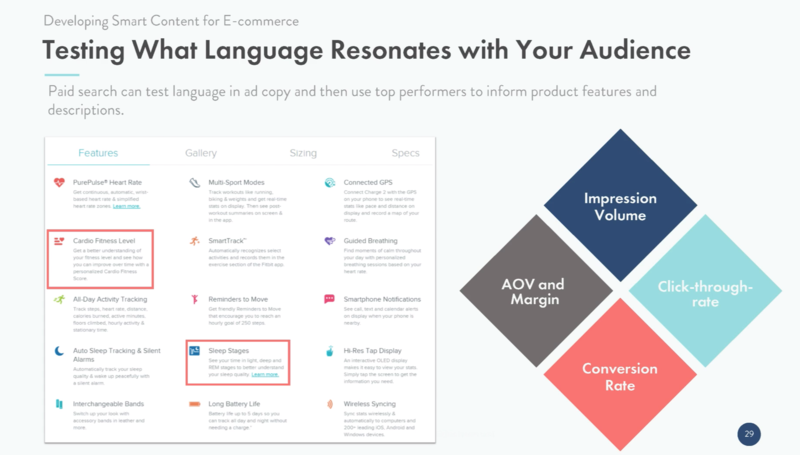 Similarly, we want to take our top languages resonating in terms of keywords and ad copy testing that we’re doing on the paid side, and get that information back to SEO because then they can incorporate call-outs in the product descriptions and in the product features. So if someone were looking at this again, another Fitbit example, maybe what’s resonating with them is cardio fitness levels or sleep stages, and so baking that into our SEO content is beneficial to the users in providing them with a good user experience. And furthermore, in doing this, this is also a good opportunity to put this content into our feeds, which will then impact how we’re showing for PLAs on the SERP as well. This is a great example where language that is resonating with PPC audiences are going to resonate with the SEO. And that type of communication or language is going to come out in the keywords that they’re typing, which is important for when you’re doing your keyword optimization and ensuring that those keywords or different phrases or language are shown on your SEO pages. One other area that the SEO team and PPC team can work together is using demographics to help create your content. 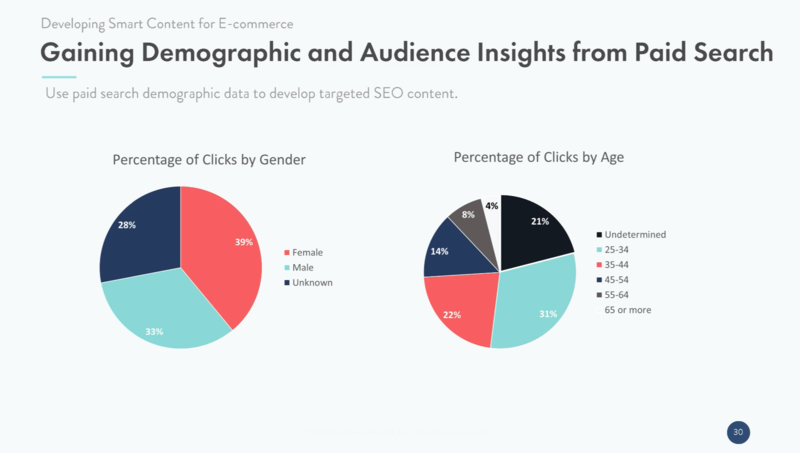 So the demographics that the SEO team can see are percentage of clicks by gender, and also by age and you can come up with a lot of great pieces of content for this. But like in most cases, the PPC team can really help out with a couple other areas, they’re able to see parental status and household income, and not only that, they’re able to add possible combinations or exclusions and mix-match to be able to provide different impression volumes on a matching or category basis. 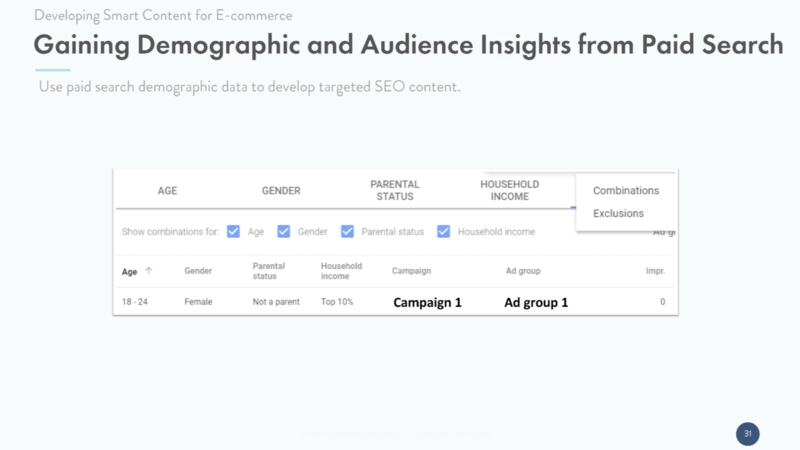 So utilizing these demographics, and using both data can really help identify that targeted content. And when you’re creating the content, creating content that resonates with your demographic. Now, let’s talk about overall integration. When we talk about overall integration, we’re talking about those teams and how they can work together to provide a better result for your company. 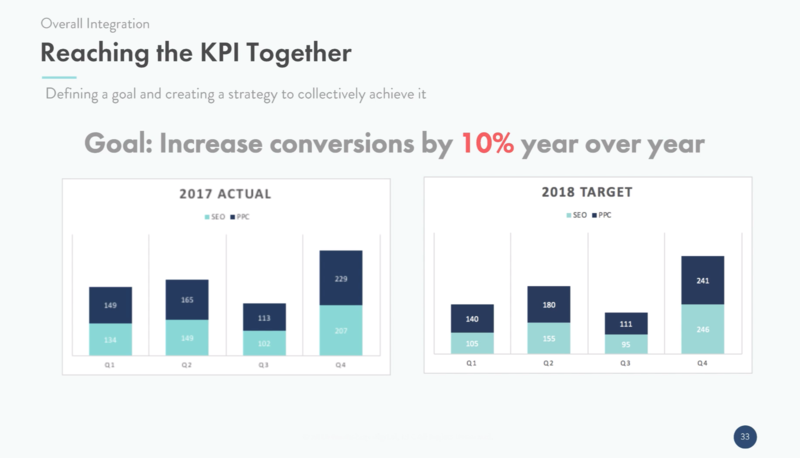 So let’s say your team, or you and your team came up with this goal, and have to achieve an increase in conversions by 10% year over year. That’s the mandate. That’s the goal. A step that we would take is we would look at last year’s actuals, and we break that up by quarter. And then we also bring that up by team. So by breaking it up this way, if we break it up in quarter year, you’re going to be able to see the the seasonality. So here you can see Q3 is much lower than Q4. So Q4 is a huge target. But also you can see historically what each on the SEO or the PPC team has done in providing those conversions for you. The next step that we’re going to do is as we’re building those projections: there are two main aspects that that you’ll want to heavily consider, among many others, potentially, for your specific business. But the two main aspects are, one – SEO takes time. So as you’re building into those leads, and you know that you have to increase by 10%, maybe you have a have a heavy focus on PPC, during the first two quarters. As you know, that initiative started in Q1 for SEO aren’t really going to see a big impact until Q3 or Q4. 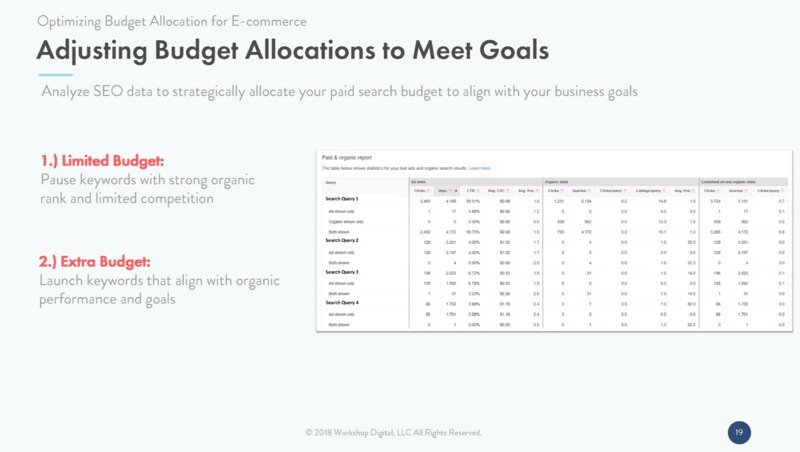 On the other side, there may be situations to where, throughout the year, your PPC budget may be limited for one reason or another. Maybe you had a couple things come up that weren’t planned, or maybe that budget was used elsewhere. Either way, there may be scenarios where historically you found that Q4 has had a lower PPC budget. So here, what we’ve done is we’ve allowed for SEO to take time and for their strategy to take place, while also realizing that maybe Q4 the PPC team won’t be able to help out with many conversions, but by putting both teams together to accomplish the same goal, you can really rely on their strengths and potential weaknesses in order to achieve your goal by working together. Another aspect of having these teams work together is what we call planned serendipity. Which is more of a an oxymoron than anything else. But what it is, is we’re trying to plan and construct an environment where we can have those serendipitous moments…those moments to where the PPC team member may walk by the SEO team member and say, “Wow, that’s interesting, I have something that might help with that,” and it happens a lot. But it only happens if you can get your teams in the same room. So if you’re not physically close together like we are here at Workshop, then you may want to plan meetings or different environments where the teams can work together to talk about some items. There are three main items that your team may want to discuss. The first is issues: these are anything, any problems that they’re seeing, any struggles that they’re having, and this is individual team members. The SEO team, might be able to bring up an issue that they’re struggling with that the PPC team might be able to help recover from or give additional insight into. Strategies: anything that you’re working on moving forward with each team member may have their strategies and they might be able to synergize together to come up with a better way to complete that strategy. And the last are just changes: and these can be from minor changes, to any major changes – just any anything that might happen. A changing of a URL, changing of focus, targeting different keywords, different things like that. Any changes and the reasoning behind those may help the team’s work better together. We want to share some key learnings and key takeaways from today. First, drive incremental traffic and revenue by maximizing your search engine results pages visibility by integrating SEO and paid search together. Next, use paid search to test. Paid search is a really great testing tool and can show quick results. So test language, texts, topics for creative, and share that information so SEO can optimize meta descriptions and also develop some content. Finally, leverage SEO to create a great user experience and content that is really valuable for your audience. Give them things that keep them coming back to your site. So not only are they purchasing from you, but they’re engaging with your site and your content. Ultimately this is going to create a community around your brand and loyal, loyal consumers. Thank you for joining us today and learning about how we integrate our SEO and paid digital marketing initiatives to create better results for our clients. Feel free to send us an email, drop us a tweet (@workshopmktg), or visit us at workshopdigital.com.